On Writing Spectacular Fiction - Spectacular Fiction! 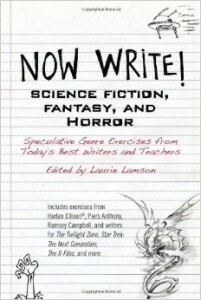 Writing speculative fiction, which broadly encompasses the fantasy, science fiction, and horror genres, comes with its own unique set of challenges not present in writing other genres. Now Write! : Science Fiction, Fantasy, and Horror is a guide to creating spectacular fiction filled with the knowledge and advice of speculative fiction authors packed into short essays and exercises. The Now Write! series of books has writing advice for lots of genres and formats, such as mystery, screenwriting, and nonfiction. I’ve come across plenty of writing books that were aimed at writers in general or writers of literary fiction. While that can be helpful, I also like to check out books with tips for my particular genre. Since I’m primarily a fantasy and horror (and occasionally science-fiction) writer, I decided to check out the Now Write! book on speculative fiction. The format of Now Write! is great for busy writers – it’s divided into broad sections on particular writing topics, such as understanding your particular kind of speculative fiction, plotting your story, developing themes, raising the stakes in your fiction, and building your setting. Each of these sections contains short articles written by a speculative fiction author (some of whom I’d previously known and others who I discovered through this book), followed by an exercise to help you put their advice into action. Though the book is filled with helpful gems, two articles I found particularly useful to my craft were Harlan Ellison’s piece on titling a story (since I often struggle with coming up with new names) and Briana Winner’s exercise on creating fiction from your past experiences, which is a process that I often use in my own writing. The advice provided in Now Write! combined with the exercises you can use on a daily basis makes this a useful addition to any speculative fiction author’s physical or digital library. Pick up a copy of Now Write! on Amazon. Next post Welcome to a Spectacular Year!